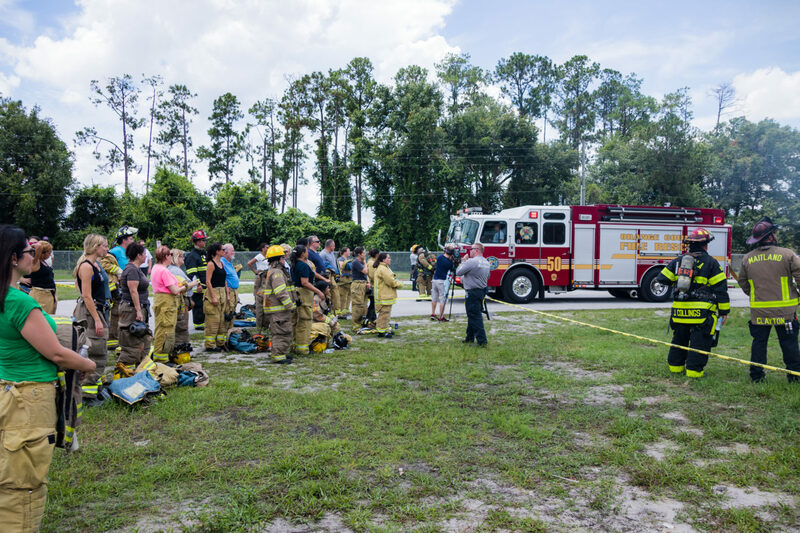 Orange County Fire Rescue Department (OCFRD) recently partnered with the Florida Firefighters Safety and Health Collaborative to host the Clinician Awareness Program. This statewide initiative provides education on the hazards of fire service and helps clinicians relate to firefighters. The two-day event took place at the Valencia Fire Training Institute in Orange County on June 26 -27, 2018. First responders have a high risk of developing Post-Traumatic Stress Disorder (PTSD) and other mental health disorders due to the physical challenges of their jobs and the emotional nature of emergency response. The Florida Firefighters Safety and Health Collaborative focuses on firefighter cancer prevention, mental wellness and overall firefighter safety. Often times, many do not seek help from professionals, but rather reach out and talk to peers who they perceive as having a better understanding of what they are experiencing. Leaders throughout the fire service sector and OCFRD are working to fix that by giving qualified clinicians the opportunity to relate to a first responder through shared experiences. At the Orange County event, clinicians experienced the weight of full bunker gear in 100 degree heat and observed as fire crews conducting mock rescue from a live fire. In addition to observing, clinicians had the opportunity to participate in a staged search-and-rescue operation with limited visibility which included a smoke simulator. Day two of the program took them to local fire stations for more one-on-one time with local first responders. Director for the Florida Firefighter Safety and Health Collaborative Jeremy Hurd, who also serves as EMS Captain with Palm Beach County Fire Rescue, said the ultimate goal is to expand this program to nationwide fire departments to boost firefighters’ emotional wellness. Every struggle is different. If you’re thinking about suicide, are worried about a friend or loved one, or would like emotional support, the Lifeline network is available 24/7 across the United States, 1-800-273-8255. The National Suicide Prevention Lifeline provides 24/7, free and confidential support for people in distress, prevention and crisis resources for you or your loved ones, and best practices for professionals. For information on crisis support and more, 2-1-1 is free, completely confidential and available 24/7. Photo Caption: Mental health professionals experience a day in the life of a firefighter at the Orange County Clinician Awareness Program on June 26 and 27, 2018 at the Valencia Fire Training Institute.